Over the past few months, Chorus has been developing a song! 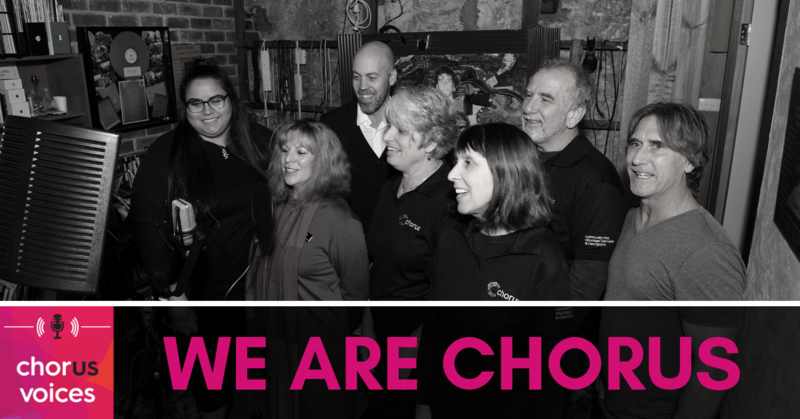 ‘We are Chorus,’ has brought staff, volunteers and customers together to tell the story of Chorus in true harmony. Make sure to read or listen to the episode all the way through – the song is played at the finale! Louise meets first with Elli and Chene from the Ability Arts Centre. The drive to create ‘We are Chorus’ started with these two – let’s hear about just where they came up with the idea for the song. Elli, Ability Arts staff and customers talked with Ability Arts musician Jeff about their idea. He jumped onboard immediately, they began to develop the song together, and the project was off to a running start. “You can hear it all over the building now, it gets stuck in your head!” Elli laughs. Next, Louise asks Chene what the song means to her. ‘We are Chorus’ never would have happened without the skill and dedication of musician and lead vocalist Jeff. Louise summarises the part Jeff played in putting the Chorus story into verse. “The song came up as an idea, and then some words were put down – then you wrote some music, and then you performed it at the 2017 Christmas party. That’s when people really got excited, saying it was really foot-tapping good,” Louise remembers. Jeff and Louise then reflect on the experience, remarking on how the song evolved and how it represents Chorus. “It’s a bit like us really, we’re an organisation evolving all the time,” Louise remarks. “It’s all about the bringing together of people. That’s totally what I wanted from the song. It was to bring the people of the company together,” Jeff says. Every hit song needs a vocalist – and ‘We are Chorus’ went the extra mile by using lots of them! Peter from the North Perth gardening team was one among them. Louise wonders what his experience was like – to which Peter responds emphatically. You can catch some more good vibes from Renae in the We are Chorus music video – watch for her bouncing out from behind the Chorus signs! Chorus volunteer driver Gary has been singing for years. “I sing for a choir. I’ve been singing for almost 15 years now and I decided to put my voice in. Any excuse to sing, I’ll take. I love it. Lots of lovely, sweet voices here,” Gary says. Louise asks Gary what he thought of the lyrics. In addition to being a Singer and Songwriter, Jeff is a Music Facilitator at Chorus. He incorporates music into his work with the Chorus Ability Arts group every Wednesday. Not only did he help write the song, he keeps it alive and well by performing it with the group. “Every Wednesday we’re playing it and they love it. They always beg me to ‘Play the Chorus Song! Play the Chorus song!’ We do it about four times a session,” Jeff says. “[Everything about the song] is a real group collaboration, [from] writing the song together to doing a workshop on the words, and deciding what we were going to sing about.” Jeff says. Louise agrees that it’s been a massive team effort throughout the organisation. How does Jeff feel about the experience? [14:12] Meet Hayley – And Hear the Song! Before Dan and Louise play the song from the studio, we hear from Hayley, a customer at the Ability Arts Centre. And with that, it’s time to listen to the song! Contributors to the podcast: Elli Moody, Chene Van der merwe, Hayley Bracknell, Jeff Funnell, Peter Varcoe, Gary Allen and Renae Ambrose. Singers ‘We are Chorus’: Renae Ambrose, Gary Allen, Robyn Coles, Vivienne Forbes, Jeff Funnell, Judith Hatton and Dan Minchin. Thanks to David Hyams all the Ability Arts crew.